We proudly design products that are stylish, comfortable and undeniably safe. We love to see your style while enjoying your Bobike safety seat(s). Our love for fashion does not make us superficial. On the contrary, we care about a lot of things. So, when we created this new Mighty Mustard color, we were not only thinking about a new fashion color to color the city, but also how we could make a do the difference and help the world a little bit. Bees play a crucial role in agriculture everywhere and represent an irreplaceable link in the food production. Bees help produce more than 30 percent of the worldâ&#x20AC;&#x2122;s food. Unfortunately, many industrial agricultural practices endanger the livelihood of these pollinators. The rise of large-scale monoculture crops including maize, wheat, and rice, can decrease agricultural biodiversity worldwide. Additionally, the use of pesticides and insecticides can kill individual bees and colonies. * Alarmed by this news and inspired by the color of our new Bobike ONE in mighty mustard, we decided to donate a part of the proceedings of every mighty mustard seat sold to an organization that helps preserve bees. ** But you can help as well! Create a little bee-heaven in your garden by planting blooming flowers and plants. Eat organic and locally produced food whenever possible. Use natural pesticides and spread the buzz on bees. Our Exclusive is an international favourite, and now it comes in a chic urban grey, so you can continue your ride in style. At Bobike, we live and breathe safety. It might not be the coolest thing to do, but youâ&#x20AC;&#x2122;ll appreciate us for it. Quality control, performance analysis and safety tests are the most important parts of product development. Of course, we comply with all legal requirements and meet the highest industry standards, but we donâ&#x20AC;&#x2122;t stop there. We have built our own modern quality control center with all the technology required to ensure that our products comply with the standards imposed by regulatory bodies. But when we test, we double the standard. Itâ&#x20AC;&#x2122;s how we roll. We take safety seriously We tell you as often as possible that our bicycle safety seats are made out of double-walled sturdy plastic and that makes our seats extra safe. But until you’ve experienced for yourself how a Bobike seat can protect your baby, it’s just a story. For Mariska the story became reality. She recently landed in a ditch with her bicycle. At the time of the accident, she was transporting her youngest daughter in a Bobike Exclusive front seat. Before they ended up in the water, they also hit a fence, on the side of the ditch. “The sturdy Bobike seat saved my daughter”, Mariska told us. “The seat protected her from the fence, which drilled through the outer part of the seat, but never touched my daughter. The belts kept her in her seat instead of launching her and, because of the easy release system at the top, I could quickly get my daughter out of the seat and push her onto dry land. I am so grateful!” Mariska continues. Of course, Mariska and her daughter got a big scare out of the whole ordeal, as did we when she told us her story. However, we are grateful that Mariska responded so adequately and that the Bobike seat lived up to its expectations. 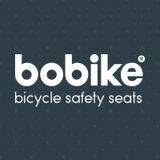 Bobike bicycle safety seats are designed to transport your most precious cargo (and an occasional office bag). stiftung warentest gives a gut to bobike one At Bobike, we live and breathe safety. 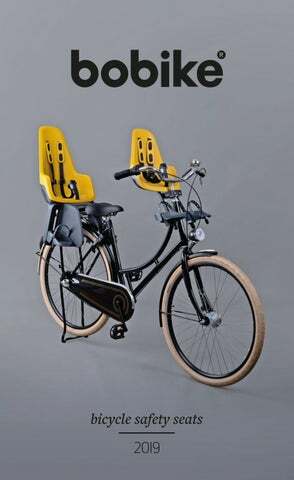 Besides clever Dutch design, comfort, and ease of use, Bobike uses a unique double-walled design for all safety seats to ensure optimum protection. This was one of the highly appreciated features by the Stiftung Warentest. The independent German Consumer Organization and Foundation - Stiftung Warentest performed a detailed test and analysis on several bicycle seats in the market. Bobike ONE 1P&E-BD was one of the models that got tested and passed the test with flying colors. This resulted in the highly respected GUT label award. This means that the Bobike ONE 1P&E-BD model achieved high scores in Stiftung Warentestâ&#x20AC;&#x2122;s main categories safety, comfort, functionality, usability, durability and chemical tests. The tests performed were more than just an extreme reproduction of the tests performed by the EN14344 standard (European safety standard for bicycle seats). Among the tests were reproductions of daily usage by actual people using the safety seat to tackle daily city commutes. So, not only did the Bobike One pass all the mechanical and chemical tests, but it also conquered the hearts of the mums and dads and, of course, the little ones that participated in the trial. The safety of our seats is our number one priority and, receiving the highest scores in safety, usage and functionality categories, just motivates us to keep up the good work and continue making one of the safest and most reliable seats in the market. Inspired by iconic items that influence modern technology and our lives. Icons you see every day, everywhere, just like our seats. Show Your True Colors As the great miss Lauper sang back in the eighties; “I see your true colors and that’s why I love you. Don’t be afraid to let them show, true colors are beautiful”. Throwback to the eighties, when we still had time for ice cream runs. Choose your flavor, pick your color and let´s GO! The Bobike GO is specifically designed for the international market where separate bicycle paths are not the norm. Now, people all over the world can enjoy the sleek and stylish Dutch design integrated into an increased protective expanded shell. The GO is an easy to use safety seat that is perfect for a versatile family that is ready to tackle the daily commute. The Bobike GO has a sleek and stylish Dutch design, featuring an increased protective shell around the head. Just like the other Bobike seats, the GO features a double-walled shell for extra safety. The carrier mounting system is completely integrated into the seat and fits on rear racks ranging from 120 to 185 mm, with tube diameters from 10 to 16 mm. No tools are needed to mount the seat to your bike. The Bobike GO is available in 5 mouth-watering pastel shades and has a user-friendly mounting system. The Bobike GO is TUV approved and meets the EN 14344 safety standard. For bikes equipped with luggage carrier 27 kg max. safety Unique reinforced double-walled seat for extra safety. Back safety reflector for extra child safety. Improved, sturdy, one-handed Easy-Click buckle. Large feet protection, preventing contact with the wheel. Extra security frame belt. Carrier mounting system compatible with carriers, in accordance with ISO 11243. Meets EN14344 standards. comfort Adjustable footrests, no tools needed. 3-points adjustable safety belt. Bobike GO® is supplied fully assembled and can, therefore, be used straight out of the box. The seat can also be moved back and forth to be adjusted according to any carrier and child size. No tools needed to assemble the seat to the bicycle. Waterproof and shock absorbing cushion. design Sleek and stylish Dutch design integrated with an increased protective expanded shell. Expanded lateral protection Carrier mounting system integrated on the seat  – no tools needed to assemble. Dutch Design & Made in Europe. packaging This product is sold in an individual box. rear bicycle safety seat for frames This Frame Mounting System it’s recent in the Bobike range. It features a safety holder with green indicators that will pop up, providing a visual sign so that you can check if the seat is properly installed. Besides that, this system allows you to move the seat backward and forward in 3 positions, according to child and bicycle size. Fits frames from Ø28 to 40 mm. Requires 105mm mounting space on the saddle tube to be installed. Fits round and oval tubes and was designed to accommodate the brake cable, preventing it from being pinched. Frames: for round and oval tubes. safety Unique reinforced double-walled seat for extra safety. Back safety reflector for extra child safety. Improved, sturdy, one-handed Easy-Click buckle. Large feet protection, preventing contact with the wheel. Extra security frame belt. Green indicators appear when the seat is correctly installed. Meets EN14344 standards. comfort Adjustable footrests, no tools needed. 3-points adjustable safety belt. The Frame Mounting System allows moving the seat back and forth in 3 positions,  according to child and bicycle size. Mounting Kit for assembling the seat included – no need for extra tools Fits bicycles with and without carriers. Waterproof and shock absorbing cushion. design Sleek and stylish Dutch design, integrated with an increased protective expanded shell. Expanded lateral protection Dutch Design & Made in Europe. one Let’s Talk From old school phones to smart phones. Modern technology got us hooked to our screens. We go nowhere without our smartphones. Try to get away from your phone for a while and enjoy your baby’s view of the world during a bike ride. Then, get your phone out again to capture the big smiles on your faces. The Bobike ONE is a fashionable safety seat that is always right on trend. New colors are launched regularly. Its compact design lets you manoeuvre through the city with ease, and the double-walled shell of the seat ensures your baby’s safety. The Bobike ONE is TUV approved and meets the EN 14344 safety standard. The Bobike ONE Mini is a bicycle safety seat that can be mounted on the front of your bike and is suitable for children from approximately 9 months to 3 years of age, or a maximum body weight of 15 kg. Mounting material for smaller and wider steering tubes is included. We have an adapter available for mounting the seat on a bicycle equipped with an A-headset. Fits round and oval head tubes. safety Unique reinforced double-walled seat for extra safety. Improved, sturdy easy-click buckle. Meets EN14344 standards. comfort Comfortable, waterproof and shock absorbing EVA cushion. Soft and comfortable shoulder pads. 2-point adjustable seatbelt. Adjustable footrests, no tools needed. Assembly key included. design The mounting block is suitable for either s maller or larger diameter tubes. A matching windscreen is available. Dutch Design & Made in Europe. mighty mustard new color Bee Nice. Save Bees. *for each mighty mustard seat sold, a part of the proceedings will be donated to an organization that saves bees. The Bobike ONE windscreen is made out of a sturdy, shock proof and fully transparent material. Its eye-catching design shape and color accent perfectly match your Bobike ONE mini safety seat. The screen is installed and removed in no time at all. You mount the Bobike ONE windscreen directly in the mounting bracket of y our Bobike mini. The windscreen can also be used in combination with the Bobike A-head adapter. design Extended polycarbonate screen. Adjustable positioning in 1 point. Available colors to match the Bobike ONE Mini. Note: Holder and tools not included. Dutch Design & Made in Europe. packaging This product is sold in an individual box. Master box contains 4 windscreens. Extra security and protection for your Bobike ONE mini seat. The Bobike lock you already know from the Bobike ONE maxi is now available in a mini version to provide additional security for your front safety seat. rear bicycle safety seat for frameand carrier mount The Bobike ONE maxi is a trendy, compact safety seat that lets you manoeuvre through the city with ease and a lot of style. The ONE maxi mounts to the back of your bike and is suitable for children from approximately 9 months to 5 years of age, and with a maximum body weight of 22 kg. The independent German Consumer Organization and Foundation - Stiftung Warentest performed a detailed test and analysis on several bicycle seats in the market. Bobike ONE 1P&E-BD was one of the models that got tested and passed the test with flying colors. This resulted in the highly respected GUT label award. Unique reinforced double-walled seat for extra safety. Back reflector for extra child safety. Improved, sturdy Easy-Click buckle. Safety combination lock included. E-BD mounting system compatible with carriers in accordance with ISO 11243. Meets EN14344 standards. Comfortable, waterproof soft cushion. Soft and comfortable shoulder pads. Adjustable footrests, no tools needed. Easy to adjust safety belt. Assembly key included. EASY mounting system for quick installation and to easily place the seat on a second bike. One System fits all: fit your seat either on frames or carriers (special feature for 1P&E-BD). Cool, up to date colors, matching the lastest trends. Dutch Design & Made in Europe. Awarded with Good Industrial Design in 2015. Awarded with the Gut Label by Siftung warentest (2,3). By choosing the One system fits all mounting system, you will get all the necessary materials to assemble the seat on the frame or on the carrier. How convenient! Simply safe.  xtra security and protection for y our Bobike seat, now available as a spare part. E The numeric lock will provide additional security for your safety seat. Lenght - 65 cm. For bikes without a carrier. If you want to mount a Bobike seat with EASY adjustment but your bike does not have a carrier, or if your carrier is not compatible, the 1 Point Mounting Set is your solution. You mount it on the saddle tube of your bike and it will fit frames with round tubes with a diameter between Ø 28-40 mm and is suitable for 26”, 28” bikes. The 1 Point Mounting Set complies with theEN 14344 safety standards. exclusive Write Your Story The romance of an old-fashioned typewriter. Every touch on the keys adds to the story. Putting in a new sheet of paper, changing the ribbonâ&#x20AC;Ś Imagine your life being your book and you are the author. Every memory you make is a new chapter in your book. Go on long rides and make lots of memories. Write an amazing book. We love being outdoors. We care about the environment and enjoy going on longer trips. Whether it is to visit family or just to enjoy the lovely weather and nature. The Bobike Exclusive features a unique contoured safety belt system that closes in the back of the seat. The system keeps your baby in an upright position, even when they falls asleep. The small handlebar on the front seat lets your baby actively participate. The Bobike Exclusive is TUV approved and meets the EN 14344 safety standard. exclusive edition mini front bicycle safety seat The Bobike Exclusive mini is the perfect choice for longer trips. The seat features a unique contoured safety belt system that closes in the back of the seat. The system keeps your baby in an upright position, even when they fall asleep. The small handlebar on the front seat lets your baby actively participate. The Dutch Consumer Organization awarded it with the Best Tested and Best Buy titles. The Bobike Exclusive mini is a bicycle safety seat that mounts to the front of your bike and is suitable for children from approximately 9 months to 3 years of age or a maximum body weight of 15 kg. safety Double-walled seat for extra safety. Unique seatbelt system keeps your child in an upright position. Body-wrapping design for extra child safety. Meets EN14344 standards. comfort 3 points adjustable seatbelt. Adjustable footrests, no tools needed. Easy to adjust safety belt. Assembly key included. design The mounting block comes with two options for smaller and larger tubes. The seat features a little handlebar letting kids actively participate in the ride. Matching windscreen available – no further tools required. Dutch Design & Made in Europe. Best tested by the Dutch Consumer Organization. Awarded Best Buy by the Dutch Consumer Organization. exclusive mini windscreen to match your bobike exclusive mini seat The Exclusive windscreen features a transparent, sturdy and shock-proof screen, in combination with a hard plastic bottom in a color to match your Exclusive seat. The windscreen is installed and removed in no time at all, and installation does not require the use of any tools. You just click it into t he handlebar on the safety seat. safety Sturdy transparent screen. Impact resistant. packaging This product is sold in an individual box. Master box contains 7 windscreens. exclusive maxi rear bicycle safety seat for frame and carrier mount The Bobike Exclusive features a stylish and fresh Dutch design that perfectly fits the current bike trends. The unique contoured belts are adjustable with one hand, and keep your baby upright, even when they fall asleep. The Bobike Exclusive maxi is a bicycle safety seat that mounts to the back of your bike and is suitable for children from approximately 9 months to 5 years of age, or a maximum body weight of 22 kg. safety Double-walled seat for extra safety. Unique seatbelt system keeps your child in an upright position. Body-wrapping design for extra child safety. Safety combination lock included. Carrier mounting system compatible with carriers in accordance with ISO 11243. Meets EN14344 standards. comfort Adjustable footrests, no tools needed. 3-points adjustable seatbelt. Assembly key included. design Easy mounting system for quick installation and to easily place the seat on a second bike. One System fits all option: fit your seat either on frames or carriers (special feature for 1P&E-BD). Dutch Design & Made in Europe. exclusive edition tour rear bicycle safety seat for frame and carrier mount The Bobike Exclusive edition tour is the perfect seat for longer rides. If you love to go out with your kids the tour offers an adjustable headrest. The unique contoured belts are adjustable with one hand, and keep your baby upright, even when they fall asleep. This unique feature lets your children enjoy longer rides in comfort. The Bobike Exclusive Tour is a bicycle safety seat that mounts to the back of your bike and is suitable for children from approximately 9 months to 5 years of age or a maximum body weight of 22 kg. safety Increased head protection area – ideal for long rides. Led Light for increased safety. Double-walled seat for extra safety. Unique seatbelt system keeps your childin an upright position. Body-wrapping design for extra child safety. Safety combination lock included. Meets EN14344 standards. design Easy mounting system for quick installation and to easily place the seat on a different bike. One System fits all option: fit your seat either on frames or carriers (special feature for 1P&E-BD). Dutch Design & Made in Europe. By choosing the One system fits all mounting system, you will get all the materials necessary to assemble the seat on the frame or on the carrier. How convenient! Simply safe.  xtra security and protection for y our Bobike seat, now available as a spare part. E The numeric lock option will provide additional security for your safety seat. Lenght - 65 cm. CLASSIC Classic Hits When you hear a classic hit playing on the radio, it immediately takes you back to a certain point in time. Faded memories become vivid again. Sometimes it willeven bring back feelings or a smell. Classics are what keep memories alive. Every brand needs a good Classic. Our Classic Junior has been the go-to junior seat for many years now. No frills, just a sleek, functional design. It offers support for children that are old enough to sit independently on the back of your bike but cannot quite cover longer distances by themselves. The lap belt avoids them from standing up. The seat offers a convenient bag bracket and when not in use, the seat folds down and can be used as an object carrier. The Bobike Classic Junior can carry up to 35 kilograms. The seat is equipped with a lap belt so that your child cannot stand on the back of the bike. The seat also offers a convenient fold away bag bracket to offer you some additional storage and, when the seat is closed, you can use it as a multifunctional carrier. Suitable for children between 5 and 10 years old or with a body weight of maximum 35kg. The Bobike Classic Junior comes with mounting hardware for attachment to the seat tube. This attachment fits round tubes with a diameter of 28-50mm. Mounting bracket for bikes without a carrier. (seatube) For round tubes Ø28-50mm. safety Extra feet protection. Wheel protection included. The hip belt prevents children from standing up. The footrests offer ergonomic support The feet protection plates prevent little feet from getting caught between the spokes. comfort Adjustable footrests – tools required. Adjustable lap belt. design Slim & foldable design (space saver). Classic style. Can also be used as an object and bag carrier. Convenient bag bracket included. Dutch Design & Made in Europe. urban black / 8010500001 product weight 4335 g / 9,56 lb (mounting kit included) product dimensions 320 / 70 (closed) x 250 x 380 mm packaging This product is sold in an individual box. helmets Capture Memories Isn’t it funny how modern technology lets us long for the past? It’s why the polaroid camera made its revival. And with Bobike’s extensive range of helmets, you will look darn good in any photo! Strike a pose, say cheese and capture memories! Bobike has one mission: to help you and your family discover the world in a healthy, happy and most importantly, safe way. Offer yourself and your child extra protection with a Bobike helmet. Our wide range of helmets will definitely offer you a helmet that fits your Bobike seats and your style. All our helmets are approved and meet the CE-EN 1078 safety standard. The fancy Exclusive seat has now a high-end helmet to match the look. With an in-mold construction, this colored matte model features an increased back safety protection, along with safety reflective stickers in order to increase the child visibility on the road. With 17 vents to help keep your child’s head cool. The helmet also features a bug net to keep your child safe from flying insects. The comfortable DIAL system and the thermoformed inner paddings will increase the fitting and the comfort for every day use. packaging This product is sold in a individual box. Let´s spread the ONE colors around. Our Bobike ONE safety seats are available in nine colors and we have helmets to match each and every one of them. The colorful matte helmets feature an in-mold construction and an expanded protective area to increase safety. The adjustable dial retention system ensures a perfect fit. The chin straps are soft and lock in a 3 point safety harness. Two rear reflective stickers increase visibility when it gets dark out. A bug net will keep your child safe from flying insects and 10 cooling vents keep your child’s head cool. kids plus xs With an in-mold construction, this model features increased back safety protection. Reflective safety decals increase the child’s visibility on the road. The helmet is available in 3 different graphic designs which will match your baby’s imagination. Multiple vents keep your baby cool and the integrated bug net protects your baby from flying insects. The slim DIAL system and the thermoformed inner paddings will increase fit and comfort. kids plus s With an in-mold construction, this model features increased back safety protection. Reflective safety decals increase the child’s visibility on the road. The helmet is available in 3 different graphic designs, which will match your kid’s imagination. Multiple vents keep your kid cool, and the integrated bug net protects your kid from flying insects. The comfortable DIAL system and the thermoformed inner paddings will increase fit and comfort. bobike go xs Offer your baby extra protection with a helmet that perfectly matches the GO® safety seats. The Go Helmet, features nine vents to keep your baby’s head cool and a bug net that provides protection against flying insects. The Easy-Lock system lets you easily adjust the helmet to the correct size and, the reflective decals make sure your baby is visible when it is dark out. bobike go s Offer your child extra protection with a helmet that perfectly matches the GO® safety seats. The Go Helmet, features ten vents to keep your child´s head cool and a bug net that provides protection against flying insects. The Easy-Lock system lets you easily adjust the helmet to the correct size and, the reflective decals make sure your child is visible when it is dark out. bobike city Bobike CITY Helmet is a trendy, compact and lightweight helmet for you to easily maneuver through the city with a lot of style. The cream and urban grey colors will match any outfit and a wide range of city bikes styles. With a removable visor, a bug net, a chin pad protector, and thermoformed set of inner paddings (extra set included), the Bobike CITY is another step of Bobike brand to improve the family safety. Bobike City has 10 vents to help with the rider’s perspiration, and a back safety reflective sticker to increase rider visibility on the road. packaging This product is sold in a individual box. Master box contains 23 helmets. pop material Bobike bicycle display â&#x20AC;&#x201C; Dutch style Bobike has developed an original display solution for retail stores. The display offers the opportunityto display every kind of seat from the Bobike range. That way, you can display the different mounting systems as well as the mini seats and their windscreens. All the spare parts are also available. Hooks Create an appealing wall display with our specific Bobike hooks. The hooks are suitable for slatwall and tegometall. Complete your Bobike wall display and allow easy shopping, by adding this magnetic brand banner at the top of the wall display. Dimensions: 990 x 300 mm. Sold as a single unit. Dune lake The Wed The Wed in the Kennemerduinen (Haarlem, the Netherlands) is a wonderful place to spend a sunny day with the kids; instant holiday mood! It is a wonderfully sheltered beach, where you are protected from the wind. The kids can play endlessly with water and sand, swim in the moored lake, climb up the high dunes and then roll back down. Ice Cream Parlor De Hoop Ice Cream Parlor de Hoop has been a household name in Het Gooi (region in the central part of the Netherlands) for more than 100 years. The Ice cream parlor that was founded in 1898 is the place to be for delicious, price winning ice cream, a cup of coffee, or ice cream cake. It is not rare to see people queued in a big line outside the shop just to get hold of one of their delicious treats. Rumor has it De Hoop sells the best ice cream in the Netherlands. Tiny Rituals The Tiny Rituals collection offers gentle caring products for moms and babies. The products have extra mild formulas and are rich in natural and organic ingredients. All products are dermatologically tested and hypoallergenic. With their Tiny Rituals products, Rituals helps the Tiny Miracles foundation in India to give underprivileged children a better start in life. Rituals donates 10% of the proceeds from the sale of the Tiny Rituals collection to the Tiny Miracles foundation. Hoeve Ravenstein The restored monumental farmhouse Hoeve Ravenstein is located in the middle of the forest in the Groeneveld estate. There is a farm shop with the tastiest organic delicacies and meat from the farmâ&#x20AC;&#x2122;s cows. There is a terrace and a petting zoo, and you are invited to have a look at the stables and vegetable garden. They regularly organize fun and educational activities for the entire family. Planet Earth We believe in a sustainable planet and in creating lasting added value. We cannot do this without considering the social and environmental effects of what we do. Which is why we recycle the majority of our waste material. Recycled materials can then be used to produce mudguards, for example. All packaging that is used inside our factories is recycled as well. Awarded with Good Industrial Design in 2015. Awarded with the Gut Label by Siftung warentest (2,3). Awarded with Good Industrial Design in 2015. Best tested by the Dutch Consumer Organization. Awarded Best Buy by the Dutch Consumer Organization.